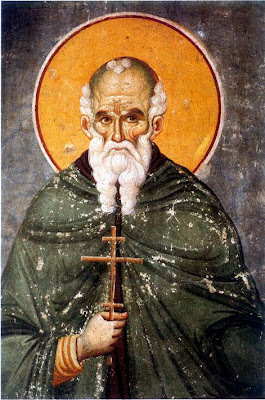 According to his biography, St. Athanasios hailed from the east, from Trebizond. After finishing his education as a teacher of literature, while still very young, he was touched by Divine Grace. He forsook the world and espoused monasticism under the guidance of his uncle (St. Michael Maleinos). It is said that when the young generals, who later played a crucial role in the Byzantine Empire, Nikephoros and Leon, visited St. Michael to confess, he guided them to the place where St Athanasios, then thirty years old, was staying and told them that he wanted to show them a ‘treasure’. After meeting and talking with Athanasios, the two men were truly amazed and concurred that indeed he was ‘a great treasure’. They were then commanded to ‘reveal all their thoughts to this very monk for ever’. Until the end of their lives, these two great men continued to have St. Athanasios as their spiritual guide. Nikephoros was so keen to be with him that they promised each other to live together as monks for ever. Nikephoros never managed to keep his part of the promise. Being a general, he was called to free Crete from the pirates. Then he became emperor against his will, and was later murdered. However, he never stopped looking after the Monastery of Great Lavra, established by St. Athanasios. St. Athanasios came to Mount Athos from Bithynia. When he reached Karyes, which was the centre of monasticism at the time, he never revealed who he was, but pretended to be an illiterate peasant. His elder had tried several times to teach him to read to assist him with his spiritual regiment. He, however, was pretending to be incapable of learning. Finally, those who knew him revealed the truth and he had to confess that indeed he was the renowned Athanasios. After that, since he could no longer live in obscurity, which he so preferred, he roamed the Holy Mountain, looking for an appropriate place to stay. He even reached the most eastern region of the Holy Mountain, ‘Melana’, where he lived as a hesychast in a cave for a while. Later on, being pressurized by Nikephoros, he began constructing the Great Lavra Monastery. The news that Nikephoros was crowned Emperor reached him before the construction had finished. Athanasios became upset with the news, because Nikephoros had broken his promise to the Lord to become a monk. Thus, he abandoned the monastery out of humility and hatred for glory, and because of his love for the hesychastic life. After writing a reprimanding letter to Nikephoros, he came to Cyprus with Anthony, one of his disciples. While in Cyprus, the Lord asked him to return to the Holy Mountain and finish the monastery. He obeyed, and by completing Lavra, he became the pillar of the monastic life on Mount Athos. He managed to initiate between the various isolated cells, sketes and hermitages communication amongst themselves. He also initiated the communication amongst his own disciples who were living inside the coenobium. Thus, they all gradually came under his obedience. They remained in their various places of abode, but they depended on him spiritually. To be honest, he had managed to establish the balance on which the long-standing Athonite monasticism rests. Therefore he ought to be rightfully named as the Abbot, the governor and the regulator of Athonite monasticism. As I have already said, he had managed to unite the isolated and difficult to reach fathers residing in Athos, under one guide, while at the same time respecting their freedom and convincing each one that they may indeed become true monks by following the philosophy of the Holy Fathers. He truly applied the relevant saying by Paul: "Having gifts that differ according to the grace given to us, let us use them: if prophecy, in proportion to our faith; if service, in our serving...the one who leads, with zeal" (Romans 12:6-8), and also ‘the hesychast with sobriety’. Therefore, St. Athanasios is not just a Saint amongst so many others, but he is the exceptional spiritual father to all hagiorite monks. Throughout the generations each one of us may find what he needs by studying his personality, his fatherly affection and providence, his illuminating intellect and his discretion, and may be fortified to pursue his goal, preserving the blessed hope that he will eventually succeed in his monastic life. Two exceptional elements single out this great beacon. One is his absolute love for hard work (φιλοπονία), the continuous carrying of one’s cross. He regarded this as the most essential aspect and the spinal cord of monastic discipline. He engaged his love for hard work mostly as part of his hesychastic discipline, which he began and continued until the time he assumed his important duties. He was so attracted to hesychasm that he used to complain that he had assumed great social responsibilities inherent in the monastic life against his wish. He fervently wished to be absolved of all duties and get on with his hesychastic life, which he had so many times enjoyed in his cave on the southeastern outskirts of Lavra, the so-called Vigla region. The second element was the issue of love, of sociability and solidarity. Even though he imposed very austere asceticism and hardship on himself, he was very loving and affectionate towards others. We believe that his abundant love and affection which has truly united monks in the context of Athonite monasticism will continue to connect them unto the end of ages, as divine providence determines through the ceaseless mediation of this great beacon. Nonetheless, if we try to extol him, we will demean him. These meager facts were mentioned as a necessary duty so that each one of us is roused in imitation of some of his various and numerous virtues. He was so determined to strengthen his flock that even during the liturgy he would sit on the left of the Holy Altar and receive the confession not only of monks of his own brotherhood, but also of many others. Prompted by the most free (πανελεύθερο) spirit of his fatherly affection to comfort and pacify all different personalities from the weakest to the strongest, he didn’t refrain using even his secular knowledge in an effort to adjust and ease the monastic discipline to enable even the weakest to boast about their monastic capacity without being discouraged. In his broad fatherly providence, he had improvised a regime which was not only unheard of, but also objectionable compared to the isolated monastic customs of the Holy Mountain. He had constructed ports, roads, cellars, vineyards, gardens and anything else which within limits could provide some comfort to the people who could and wished to become monks. This effort had created grievances. As it is mentioned in his biography, he was regarded as ‘the introducer of innovation’. He was then slandered and had the Administration of Mount Athos rally against him. They were about to pass judgment against him on charges that he had violated the regime and the type of hesychasm which the fathers followed, but the Mother of God intervened personally and pacified them. She also encouraged him to continue his task boldly without discouragement. On any occasion, when he was financially hard up and could not continue his immense task, our Lady would personally console him. Her promises and her presence were so real and perceptible that when the storage rooms and the cellars were empty once, she presented herself and told them: "I am the Provider (Oikonomos - Oικονόμος), have concern no more". Indeed on several occasions, when the numerous laborers, monks and lay people could not be fed, the storage rooms were filled with provisions at her command. Ever since, this holy monastery does not have an official Provider, like other monasteries, but only a deputy Provider. Her icon, the so-called Oikonomissa, which was the one performing this miracle, is still at the Oikonomeio and performs even more miracles. The monks show their particular veneration to the icon and express their gratitude to the Mother of God. Several times she was seen to bless and increase the provisions in the cellars according to the monastery’s needs. This is what I wished to remind you of tonight. Most of you are already aware of it. But you must now pay more attention and direct your respect to this fact: Namely, that even though there are now several different regimes and various pious elders, the Great Elder, Abbot, Spiritual Father and Protector for each one of us is the most holy Father St. Athanasios, who is also inexplicably the continuator of the order and the provider of this place, if not of the entire eastern monasticism. With his mediation and the mediation of the Most Immaculate Lady Mother of God, Lord Jesus Christ, our Lord, have mercy on us and deliver us from our sins. Amen.